Home » Maxuruna. Brazilian indigenous tribesman. Maxuruna. A Brazil indigenous tribesman of the Matis indians, known as Jaguar people. From the journey undertaken by the author with Johann Baptist Ritter von Spix (1781-1826), between 1817 and 1820. South America, 19th century. The Maxaruna correspond to today’s Matis indians. The Matis are an indigenous people of Brazil, comprising about 300 members. They live by hunting and crop production. Their settlement area is located in the Javari Valley, a large indigenous area in the northwest of Brazil near the Peruvian border. In the years 1975-1976 the Matis were first contacted by the Brazilian organization for the protection of indigenous peoples FUNAI. But only in 1978 succeeded the FUNAI, at the time to visit five villages of the Matis. 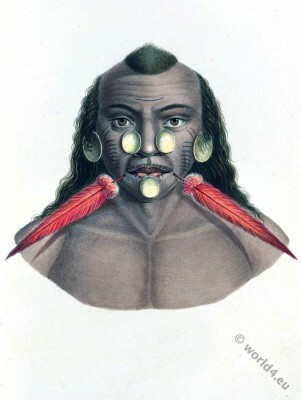 Members of the Matis traditional wearing tattooed lines, as well as various facial piercings. These include dilated pierced ears, Septumpiercings in the nasal septum, various forms of labret piercings in the mouth area and several small Nostril piercings through the nose, reminiscent of their adornment to the whiskers of a cat. The face decorations and tattoos are a sign of tribal belonging and should resemble the appearance of a jaguar, which is why the Matis are also known as Jaguar people. This entry was posted in 1817, 19th Century, Brazil, Latin America and tagged South America, Traditional Brazil costumes on 1/21/16 by world4.